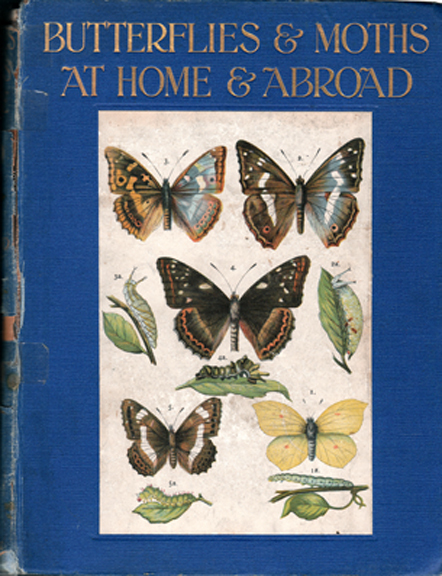 Description: A comprehensive volume detailing every aspect of Lepidoptera. The book is split into two sections: the first describes areas such as species classification, the terminology applied when describing aspects of their structures (e.g. wings, antennae, &c.), colonisation, behaviour, and so forth. The second section describes each species in detail and forms the bulk of the book. Fully illustrated with 21 wonderful, tipped-in colour plates, this is the ideal book for amateur and professional entomologists alike, whilst butterfly enthusiasts will take delight in the excellent illustrations. Overall condition is good, though the spine has quite a bit of damage. It is held in place by three strips of clear, adhesive tape, and is missing roughly ½ cm (0.2″) of its head. There are also some losses to the cloth, exposing the binding beneath. Despite the damage, all the text on the spine remains intact, and even the gilding has been preserved. The front and rear boards are in very good condition – except for the bumped corners. Internally, the pages have been subject to varying degrees of foxing: some have two or three marks around the edges, whilst others have considerably more. The worst affected areas are the endpapers and the pages immediately before and after. The flyleaf and frontispiece have come loose, though the rest of the binding is tight. Measures 26.5 cm × 20 cm (10.6″ × 8″). 4to. 271 pp.